Not quite wagon, not quite SUV, the 5-door Honda Crosstour represents a unique take on the crossover-utility vehicle. The 2015 honda crosstour electric vehicle qualifies for a federal tax credit of up to $7,500, effectively reducing the net base price. Honda calls its 2015 Crosstour a crossover-utility vehicle, but most who see it say it looks more like a customized Accord wagon. Part sedan, part wagon and part SUV, the Crosstour won’t easily be mistaken for anything else on the road. Its sharply raked rear hatch imparts a sense of sportiness, but also degrades the Crosstour’s ability to hold bulky or tall cargo. Advantage, Subaru Outback and Toyota Venza. The Crosstour also comes up a bit short when it comes to fuel economy, easily outmatched by AWD sedans like the Subaru Legacy and Ford Fusion. The Crosstour’s Honda nameplate, however, holds much value in the automotive world, providing it with a proven track record for reliability and quality. If you’re looking for a one-off vehicle capable of tackling deep snow and rough road conditions, but a bulky SUV isn’t for you, check out the 2015 Honda Crosstour. Unique styling and Honda quality make for a tempting combination. If, like most crossover-SUV shoppers, you think cargo space is of primary importance, the Crosstour’s limited offering may be a deal killer. If you’re looking for AWD and a 4-cylinder engine, you’ll have to look to the Subaru Outback or Toyota Venza, as only the Crosstour EX-L V6 offers AWD. There are no major changes scheduled for the 2015 Honda Crosstour. Regardless off its exterior demeanor, Honda’s Crosstour crossover SUV for 2015 has its underpinnings firmly linked to the excellent Accord family sedan. Get the Crosstour out on a long stretch of open road, and this point becomes immediately obvious. The Crosstour feels as agile and calm as its sedan counterpart, and, thanks to Honda's Active Sound Control, its interior is equally as quiet. Body roll and lean are minimal in most maneuvers, but the Crosstour’s added ground clearance (6.2 inches) somewhat lessens the fun factor in the curves. With a curb weight of 3,700 pounds, the Crosstour’s standard 4-cylinder engine has its work cut out, which is why we recommend going with the more potent 278-horsepower V6. One area of concern is rearward visibility, or more accurately, the lack of it. Blame the Crosstour’s narrow rear glass and surrounding body for the obstruction. This removable plastic utility box adds nearly two cubic feet of space to the Crosstour’s cargo area and is easily removed for quick cleanups. The Honda Crosstour for 2015 shares the same part-time AWD system as the CR-V. Honda’s Real Time 4WD is inactive under normal driving condition, allowing the front wheels to pull the car. But, when the system detects slippage, power is routed to all four wheels until traction is restored. Inside, Honda’s 2015 Crosstour is nearly identical to the 8th-generation Accord sedan on which it is based. The dash layout is ergonomically smart and constructed with high-quality materials. The center stack features an attractive, high-tech appearance thanks in part to a pair of optional LCD screens. In terms of storage, behind the 60/40-split rear seat is a 25.7-cubic-foot cargo area with reversible floor panels, which comes in handy when dealing with messy items. With the rear seats folded flat, the Crosstour offers 51.3 cubic feet of maximum cargo capacity, though most wagons and SUVs can accommodate considerably more. From the outside, the 2015 Honda Crosstour looks like a 4-door Accord onto which a large, sloping rear end has been grafted. Despite recent cosmetic “enhancements,” we feel the Crosstour’s odd proportions and over-the-top styling cues make it look more caricature than car. The fastback-style rear end severely cuts into the Crosstour's cargo area, and the narrow opening makes loading bulky items a real challenge. Unlike some of its lofty rivals, however, the Honda Crosstour is an SUV that doesn’t require a leap of faith to exit the vehicle. In base EX form, the Crosstour includes 17-inch aluminum-alloy wheels, fog lights, heated power side mirrors, cruise control, auto on/off headlights, a rearview camera with on-screen guidelines, a 10-way power driver’s seat, a power moonroof, and a 7-speaker sound system with Bluetooth phone connectivity and a USB port. With regards to safety, all Crosstours for 2015 feature six airbags, the latest electronic stability aids, and active headrests designed to minimize whiplash-related injuries in the event of a rear-end collision. Apart from navigation and all-wheel drive, optional features for the 2015 Crosstour are tied to trim level. Regardless of engine choice, every EX-L model includes forward-collision and lane-departure warning systems, dual-zone climate control, leather upholstery with heated front seats, and touch-screen audio with Pandora Internet radio and hands-free text messaging functionality. On a sour note, only EX-L models offer the basic Bluetooth profile that enables you to wirelessly stream music from your MP3 player or mobile phone to the vehicle. To put that into perspective, the vast majority of modern compact cars include Bluetooth audio streaming as standard fare. 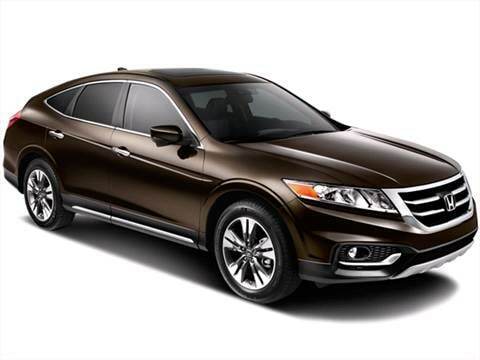 The Honda Crosstour for 2015 offers a choice of two engines: a 2.4-liter 4-cylinder or a 278-horsepower 3.5-liter V6. The optional V6 employs Honda's Variable Cylinder Management system, which allows the engine to run on three, four or six cylinders, depending on load demands. A rather outdated 5-speed automatic is the only transmission available on 4-cylinder models, while V6-equipped Crosstours make use of a 6-speed automatic with steering-wheel-mounted paddle shifters. With a starting Manufacturer’s Suggested Retail Price (MSRP) of just over $28,350, the 2015 Honda Crosstour is priced nearly $1,500 less than the Toyota Venza, but some $2,600 more than a Subaru Outback that includes all-wheel drive at no additional cost. And, unlike the Toyota Venza, only the Crosstour’s range-topping EX-L V6 trim can be had with AWD. To that end, it’s worth noting that the EX-L V6 with AWD and navigation checks in close to $40,000. If you’re ready for the next step, KBB.com's Fair Purchase Price Tool provides you with the necessary information to get the best deal on your next car. Whereas the majority of Honda products lead their respective classes in terms of resale value, the 2015 Crosstour is expected to hold only average 5-year residuals. Have owned 5 Hondas in family, Crosstour is fav!